You will probably know of the St Patrick story, usually rolled out this day, of how he converted the Irish. Patrick was trying to persuade the Irish High King to adopt the Christian faith, when the King asked him how the Christian God could be three Persons in one Being; surely that was a nonsense. Patrick lowered his eyes; and ton the ground he saw the now-famous three-leafed Irish clover. Plucking off a stem, he showed it to the King, explaining that just as the three leaves made up one whole clove, so the three Persons of the Trinity made up the unity of God. The King was said to be so impressed that he allowed Patrick and his monks to continue their mission, and eventually became a Christian. A good story maybe. It’s fortunate that it wasn’t St Patrick’s lucky day and he didn’t pick up a four leaved clover otherwise Irish theology and doctrine would a completely different to everyone else’s. But I’m sure many of us might sympathise with that Irish King when it comes to the Trinity. The Trinity of God however, is not meant to be easy. What it speaks about is impossible to describe. Of course, it wasn’t designed by people to be incomprehensible, but what the doctrine attempts to do is actually impossible. If we believe in God at all, then that God must by definition be beyond our comprehension. St Patrick was entirely wrong, but he got away with it – there is nothing in creation analogous to God. Nothing. For God to be the creator of all He cannot merely be a “supreme being”. He is not of the universe, he made it, existing before it and outside it. If we are not speaking of that God, then we do not speak of God at all. So the Trinity is Christianity’s approximately way of speaking of the indescribable. The early Christians had to makes sense of who they had experienced God in Christ, very hard good Jews brought up to say the The Shema every day of their lives “Hear, O Israel: the LORD our God, the LORD is one” (Deuteronomy 6:4). However two things had changed their world. One was Jesus, and the second was Pentecost. God was now known to them in three persons ; not one person in different forms at different times, but three persons. As the apostles moved out from the upper room at Pentecost, they discovered that the power of God now accompanied them. They started to write down what the Spirit revealed to them. Nowhere did they explain what the Trinity was, only what it was like, that which mattered the most, its character and nature. What was God like in his essence? To explain that I refer back to the event that i expect most of you did witness, namely the wedding of Prince Harry and Megan. We had a group around our house to watch it and the one thing that transfixed us all was , unusually, the sermon. It was given by Bishop Michael Curry the current presiding bishop and primate of the Episcopal Church in North America. His words transfixed a nation with a sermon on love…..
“Oh there’s power, power in love. Not just in its romantic forms, but any form, any shape of love. There’s a certain sense in which when you are loved, and you know it, when someone cares for you, and you know it, when you love and you show it – it actually feels right. “There is something right about it. And there’s a reason for it. The reason has to do with the source. We were made by a power of love, and our lives were meant – and are meant – to be lived in that love. That’s why we are here. God is love is a phrase written by John the Apostle in 1 John 4:8. John does not say God “loves” or is loving, but God is love. It means that God is love in his essence, and that love is the only eternal thing. Before anything was, and after everything has ceased to exist, there was and always will be love, because God exists in himself as love. God is held to exist in eternity always in a communion of the persons. This means that there is and always has been love in existence, even before existence existed there was love. God is eternally self sufficient. He does not need creation to be God, creation flows from pure love, the desire to share existence. So God who is all, desires to share life with us, so he created everything we see. Actually 1 John 4:8, in full, says this : Whoever does not love does not know God, because God is love. If we seek to emulate the God in our lives, which is discipleship, it is what we are here for, then the only way we can get close to that is by showing love. We cannot do it by becoming clever or theological, or musical or liturgical, or any other way. All these ways may help but they are not the essence of following God. 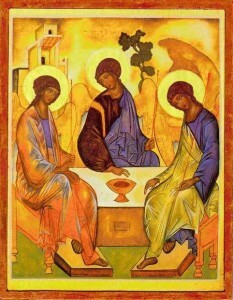 To live in that simple reality is to emulate the trinity. To live like that is to be, in the words of Jesus, “Born from above 2. Sometimes translated as “Born again”, Jesus words to Nicodemus describe how we become part of that true reality – we when we become Christians are reborn from above – the power of the Holy Spirit creates a new person in us, called and equipped to live in the same way as God the trinity. Please please please do not be cynical about Bishop Curry’s words. They do not simply constitute one possible way of changing this world – they are the only way. I am not going to repeat the Bishop’s sermon on love. I wholeheartedly recommend you go onto YouTube and listen to it again for yourself. I’ll repeat just some of his words……..
“Imagine our homes and families where love is the way. Imagine neighbourhoods and communities where love is the way. “Imagine governments and nations where love is the way. Imagine business and commerce where this love is the way. “Imagine this tired old world where love is the way. When love is the way – unselfish, sacrificial, redemptive. “When love is the way, then no child will go to bed hungry in this world ever again. “When love is the way, we will let justice roll down like a mighty stream and righteousness like an ever-flowing brook. “When love is the way, poverty will become history. When love is the way, the earth will be a sanctuary. He may have spoken for 6 minutes longer than he should have done, and maybe he was a bit unBritish in his delivery, but what a sermon it was. To be Trinitarian means more than holding to a mysterious doctrine. It means being a person of love. The person who makes others their primary concern, whatever their doctrine, is more Trinitarian than the highest professor of theology, if there is no love in his or her life.